Most everyone has a “go-to” bar, that reliable spot to meet up when you’re just at a loss for new suggestions. It’s convivial, relaxing, and if you’re really lucky, within tripping distance of your abode. Bar Pilar fits this description for me. It certainly doesn’t hurt that it boasts a truly beautiful old-fashioned bar, retro murals and decor in a sort of New Orleans-on-the-Med vibe, with candles giving off a golden glow, making almost everyone look good. It’s slowly but steadily become one of my favorite bars to hang out in DC. 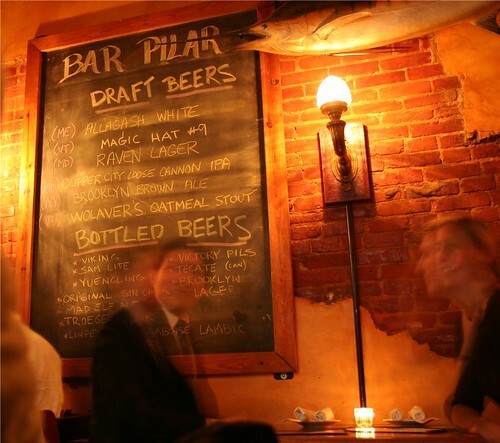 Usually a low-key spot, Pilar mostly avoids the excess popularity that can plague nearby hotspots like Saint Ex, Marvin or Cork. Perhaps that’s because of its intimate size, attracting people in twos and threes as opposed to packs. There’s a varied selection of wine, beer, and cocktails, not to mention a kicking food menu, encouraging a chill/graze mentality as opposed to a frontloading meat market. But as this is our drinks feature, I’ll just focus on two of their cocktails off the “classics” menu, and leave the food for a later date. Though I’ve never been much of a gin drinker, I just had to order the Bee’s Knees – considering my goofy tendency to use archaic expressions like “the cat’s pajamas” and “johnny-on-the-spot”. Made with plymouth gin, lemon juice, and honey syrup served straight up with lemon zest, it was like drinking the last of summerlight in a glass. Or maybe I was just high off the gin fumes. But seriously, it was an excellently wellcrafted cocktail meant to be slowly sipped, not sucked down like a desperate bootlegger. The Michalata also intrigued me – Tecate, tabasco, lime juice, and the always mysterious “bloody mary mix”. The bartender quipped, “It’s like… a beer Bloody Mary.” He elaborated with a story about a Salvadorean girl who used to mix all the ingredients in the beer can – I don’t know, maybe it was the gin of the Bee’s Knees again, but it sounded perfect, precisely the kind of story Hemmingway would’ve told, so fitting as Bar Pilar’s name is an homage to his boat. Indeed it was the perfect summer drink – found too late – the beer’s carbonation cutting the tomato’s acidity and the spicy salt on the pint glass smarting my lips – sigh. Bu I’m sure Pilar’s mixologists will come up with some way to put autumn in a glass, maybe on a Tuesday when they present their special “sessions” menu. I can’t wait to find out how they mix it up. BP is definitely a local favorite, although it’s nearly impossible to find a place to sit on a busy night. Aren’t they owned by the same people as Saint Ex? I think they are, Max, though I’ll have to check for sure. I seem to remember hearing something once about how the owner of Saint Ex opened Pilar when he was aghast at the surge in SE’s popularity with the bridge-and-tunnel-popped-collar crew. Oh, wow! That’s my photo! AND I was at bar pilar just last night. It’s my favorite place to go for cheese and good wine! Hi gingher, glad you are a Pilar fan as well. And I think your photos are really fantastic!